Va Qin Shi Huang (Sheenish: 秦始皇; pinyin: Qín Shǐhuáng; Wade-Giles: Ch'in Shih-huang) (259 RC – 210 RC), ennym persoonagh Ying Zheng (Sheenish: 嬴政; pinyin: Yíng Zhèng), ree y steat Sheenagh Steat Qin veih'n vlein 246 RC derrey 221 RC car Eash ny Steatyn Caggee. Haink er dy ve ny chied impir er y Çheen unnaneysit 'sy vlein 221 RC. Va'n çheer fo reirey echey derrey yn laa baaish echey ayns 210 RC as eh 50 bleeaney d'eash. ↑ (Baarle) "Emperor Qin Shi Huang -- First Emperor of China", TravelChinaGuide.com. Feddynit magh er 2007-09-10. ↑ (Baarle) Wood, Frances. (2008). China's First Emperor and His Terracotta Warriors. Macmillan publishing. ISBN 0-312-38112-3, 9780312381127. p 2. ↑ 3.0 3.1 (Baarle) Duiker, William J. Spielvogel, Jackson J. Lhieggan: 5, daahit. (2006). World History: Volume I: To 1800. Thomson Higher Education publishing. ISBN 0-495-05053-9, 9780495050537. dg 78. ↑ (Baarle) Ren, Changhong. 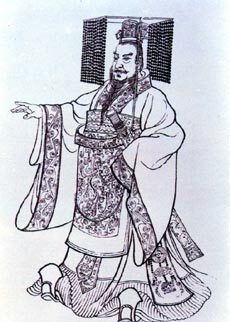 Wu, Jingyu. (2000). Rise and Fall of Qin Dynasty. Asiapac Books Pte Ltd. ISBN 981-229-172-5, 9789812291721.